This article is the fourth in a series on singing in Irish. The previous three articles are Singing in Irish – Yes, It’s a Language, Singing In Irish – The Sean-Nós Tradition and A Listener’s Guide to Irish Song: A Taste of Sean-nós. 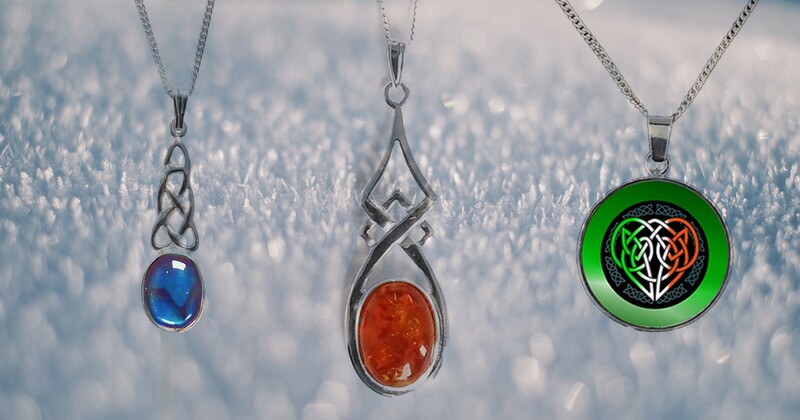 For the rest of the world, Christmas may be a long way off, but for members of one very special choir, Christmas starts in just a little over two weeks, when Mary Mc Laughlin’s Cór Ainglí begins its summer rehearsal season. 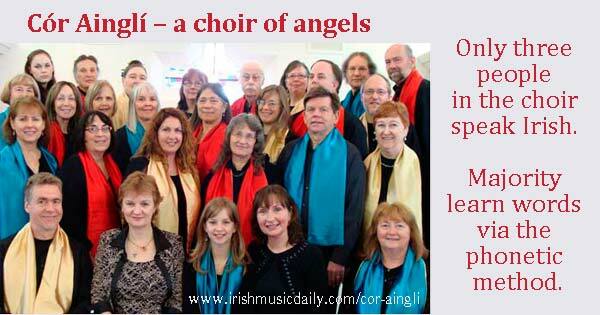 Cór Ainglí (Irish for “Angelic Choir”) is North America’s only Irish-language Christmas choir. Founded in 2006 by renowned Irish singer, songwriter and teacher Mary Mc Laughlin, the Santa Cruz, California-based SATB choir performs between two and four concerts each December, entirely in Irish Gaelic. When you think of Irish singing, you don’t usually think of harmony…let alone full-on choral arrangements. When Mary was arranging music for her third solo album, “A Gaelic Christmas,” however, she found herself wanting to hear the music performed live (on her CDs, she layers tracks, so her own voice provides both melody and harmony…a rather difficult feat to do on-stage!). She began searching for singers who might be interested in joining an Irish-language community choir and, in December of 2006, led the first sold-out performance of the group she named Cór Ainglí (after a phrase in the first line of the Irish version of “Angels We Have Heard On High”). Cór Ainglí is a little different from other community choirs. For example, prospective members don’t need to be able to read music.In fact, several members of the choir come from folk traditions in which music reading is neither traditional nor even necessarily desirable. What is essential, however, is the ability to hold a part independently and to blend with other singers. The ability to speak Irish is not required either (in fact, most choir members don’t). Mary teaches the words to all the songs using a phonetic method. What is required, however, is commitment. Because the words and the parts are transmitted aurally, an early start is absolutely necessary. Rehearsals start with a series of weekly workshops, beginning in early June and going through July (the first workshop is also a group audition for prospective members). Members are given extensive materials to work with, including practice CDs, and are expected to practice on their own between rehearsals. The choir takes a brief rehearsal break later in the summer, and then comes back in the fall to polish the music and to prepare for the December concerts. The choral arrangements are all Mary’s own, and they differ in many ways from classical arrangements. The melody is often in the alto rather than in the soprano. The harmonies tend to favor intervals more typical of traditional Irish music than of classical music. The instrumentation favors folk instruments, such as lever harp, flute, fiddle and bodhrán. The singers are encouraged to close to the consonants, as sean-nós singers do, rather than to sing on the vowels in the manner of classically trained singers. All this results in a highly distinctive sound that sets Cór Ainglí concerts apart from other Christmas choral offerings. And, judging from five years of sold-out venues, it’s a difference that audiences appreciate! 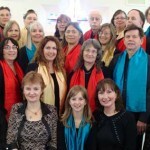 If you’d like to learn more about this unique blend of Irish traditional music and western choral music, take a look at Cór Ainglí showcase pages (which includes video clips from Cór Ainglí’s 2009 performance at Holy Cross Church in Santa Cruz, CA). See the other articles on singing in Irish. Click the links below. 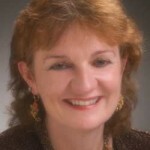 See our series of articles on singing in Irish by Cór Ainglí member Audrey Nickel.